A number of factors influence prognosis in myelodysplastic syndromes (MDS), including the number of and severity of cytopenias, extent of morphologic dysplasia, blast count, and genetic findings. The 4th edition World Health Organization (WHO) classification of MDS, updated as a revised version in 2016, recognizes several distinct MDS entities with particular clinical behavior and clinicopathologic features. 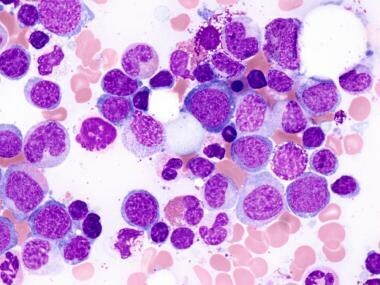 [1, 2] Bone marrow and peripheral blood blast counts are strong prognostic indicators in MDS: Patients with increased blasts at diagnosis have a poorer survival, and an increasing blast count in patients already diagnosed with MDS is often a harbinger of transformation to acute myeloid leukemia (AML). [3, 4, 5, 6, 7] Thus, blast counts of both the blood and bone marrow have been incorporated as critical features in the WHO classification of MDS. MDS with excess blasts ([MDS-EB], previously termed refractory anemia with excess blasts [RAEB] in the 2008 WHO Classification) is a specific MDS entity characterized by increased myeloblasts in the bone marrow and/or blood or the presence of Auer rods. The thresholds of what constitutes an increase in blasts differ in the blood and bone marrow. 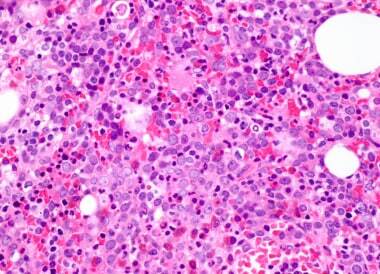 MDS = myelodysplastic syndrome; MDS-EB1, MDS-EB2 = MDS with excess blasts, subtype 1 or 2. The presence of either 5%-9% blasts in the bone marrow (with <5% blasts in the blood and absence of Auer rods) or 2%-4% blasts in the blood (with <10% blasts in the bone marrow and absence of Auer rods) classifies an MDS case as MDS-EB1, whereas the presence of 10%-19% blasts in the bone marrow, 5%-19% blasts in the blood, or the presence of Auer rods classifies an MDS case as MDS-EB2. If a t(8;21)(q22;q22.1);RUNX1-RUNXT1, inv(16)(p13.1q22)/t(16:16)(p13.1;q22);CBFB-MYH11, or PML-RARA rearrangement is detected, the case should be classified as AML, even if the blast percentage falls within the MDS-EB1 or MDS-EB2 range and/or Auer rods are present. If the patient has a history of cytotoxic chemotherapy or radiation therapy, the case should be classified as therapy-related MDS. See Pathology of Myelodysplastic Syndrome With Ring Sideroblasts, Chronic Anemia, Pediatric Chronic Anemia, and Acute Anemia for more detailed information on these topics. As with other types of myelodysplastic syndromes (MDS), MDS with excess blasts-1 (MDS-EB1) and MDS-EB2 tend to occur in older adults with a male predominance. In a series of unselected MDS patients, MDS-EB1 represented 15% and MDS-EB2 represented 20% of all MDS cases. Thus, MDS-EB is a relatively common form of MDS, accounting for over one third of cases. Also as with other types of MDS, patients with MDS-EB usually present with symptoms related to cytopenias. MDS-EB is often diagnosed in patients who carry a previous diagnosis of lower-grade forms of MDS (such as MDS with single lineage dysplasia [MDS-SLD], MDS with multlineage dysplasia [MDS-MLD], or MDS with ring sideroblasts [MDS-RS]), and in such cases is indicative of disease progression. Note that a diagnosis of MDS-EB should not be made in patients who have recently received granulocyte growth factors, as these may increase blasts in both the blood and bone marrow. Clinical follow-up and, if indicated, repeat marrow and/or blood sampling should be performed in such cases to confirm a diagnosis of MDS-EB as opposed to a transient increase in blasts due to the administration of growth factor. Obtaining an accurate blast count in myelodysplastic syndrome with excess blasts (MDS-EB) is critical, and counts should be derived from at least 200 cells in the peripheral blood and at least 500 cells in the bone marrow aspirate smears (see the images below). Counting from several different areas of the aspirate smears and from multiple slides is important, because the distribution of the blasts may vary. The blasts in MDS are often small and can be confused with lymphocytes in thickly spread or poorly stained smears. If the aspirate smears are hemodiluted due to the presence of marrow fibrosis (see below), a bone marrow blast count may performed on touch preparations from the core biopsy. It is important to note that in the revised 2016 World Health Organization (WHO) Classification, the bone marrow blast count is always a percentage of all nucleated cells (ANC) and is no longer calculated as a percentage of the non-erythroid cells, even in cases with over 50% erythroid cells. [2, 10] Thus, the previous acute myeloid leukemiaa (AML) category of acute erythroid leukemia ([AEL]; erythroid/myeloid type) has been eliminated in the revised classification. 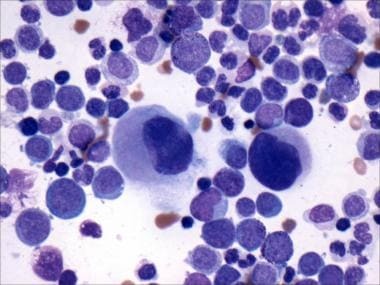 Bone marrow aspirate from case of myelodysplastic syndrome with excess blasts-2 (MDS-EB2). An erythroblast with deeply basophilic cytoplasm can be seen in center of image; myeloblasts are smaller, with scant pale cytoplasm. A pseudo-Pelger-Huet cell is also present (center of image). The bone marrow biopsy in MDS-EB cases is usually hypercellular and shows variable dysplasia in one, two, or three lineages. The bone marrow biopsy exhibits architectural disorganization (see the images below) in that the normal clustering of erythroid and myeloid elements is disrupted, and erythroid elements and megakaryocytes may be inappropriately located adjacent to bone trabeculae. Bone marrow biopsy from case of myelodysplastic syndrome with excess blasts-2 (MDS-EB2. The marrow shows marked architectural disorganization, with disruption of erythroid islands. 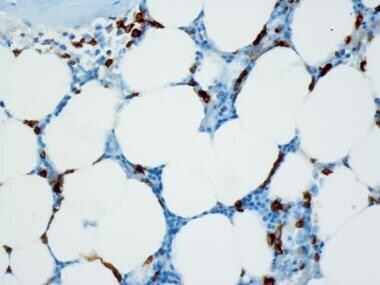 CD34 immunohistochemical stain of case of rmyelodysplastic syndrome with excess blasts-2 (MDS-EB2). Myeloblasts, difficult to enumerate on routine histology, are shown to be increased by presence of numerous CD34+ mononuclear cells. 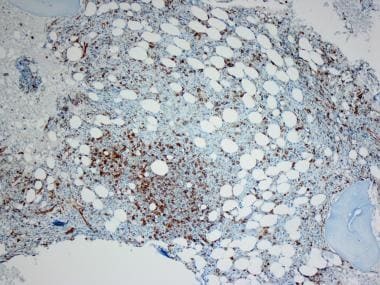 Abnormal localization of immature precursors (ALIP) in case of myelodysplastic syndrome with excess blasts-2 (MDS-EB2) is revealed by CD34 immunostaining, showing a cluster of CD34+ blasts (center of image), located away from bone trabeculae. Many cases of MDS that manifest with a fibrotic marrow represent cases of MDS-EB. If the aspirate smears are dry or nonrepresentative, the increased blasts can often be demonstrated by CD34 staining of the bone marrow core biopsy (see the next section, Immunophenotypic Features and Methods). These fibrotic MD-EB cases exhibit moderately or markedly increased reticulin staining and usually show increased megakaryocytes, including many small forms with hypolobated nuclei. [14, 15] CD34 immunostaining also may be useful in hypocellular MDS cases, in which excess blasts may be underrpresented in the bone marrow aspirate smears. Flow cytometry can not only give an estimate of the blast count based on light scatter and/or expression of precursor antigens CD34 and CD117, but it can also detect bone marrow dysplasia. However, although the flow cytometry blast count does correlate with prognosis in MDS,  flow cytometry blast count should not substitute for the "gold standard" of a manual count of the bone marrow aspirate and peripheral blood smears. The flow cytometry blast count may be artifactually decreased as a result of hemodilution, loss of blasts during specimen processing, lack of expression of CD34 by blasts, or unusual light scatter and CD45 expression characteristics that may cause blasts to fall outside the typical gate. Conversely, the blast count may be artifactually elevated as a result of the loss of non-blast cells (eg, erythroid elements) during specimen processing or the presence of non-blast cells (eg, dysplastic myeloid elements) within the blast gate. Thus, in instances of noncorrelation between the morphologic and flow cytometric blast counts, the former should be considered as the standard. Of course, the pathologist should use his/her judgment, because on some occasions the aspirate smears may be very hemodiluted and, in such cases, the flow cytometry sample may be more representative. In situations in which the bone marrow is fibrotic, a poor aspirate smear may be obtained, thereby precluding an accurate blast count. A blast count may often be obtained from a Wright-Giemsa stained touch preparation prepared from the unfixed core biopsy in such cases. However, in cases with a poor aspirate and lacking, or with, a poor touch preparation, the core biopsy is likely to be more representative. 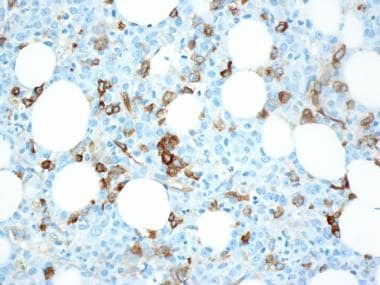 Because assessing the blast percentage in bone marrow trephine biopsies on routine histology is often difficult (particularly when numerous early myeloid precursors and erythroid elements are present), immunohistochemistry is very helpful in these situations. The prognostic relevance of bone marrow blast count in MDS has been extensively validated. [3, 5] Excess blasts in MDS are associated with a poorer prognosis that is independent of the mutation status or karyotype  ; thus, accurate counting of bone marrow and blood blasts remains highly relevant in risk-stratifying MDS, even in the current era of advanced genetic characterization. Vardiman JW, Thiele J, Arber DA, et al. The 2008 revision of the World Health Organization (WHO) classification of myeloid neoplasms and acute leukemia: rationale and important changes. Blood. 2009 Jul 30. 114 (5):937-51. [Medline]. Arber DA, Orazi A, Hasserjian R, et al. The 2016 revision to the World Health Organization classification of myeloid neoplasms and acute leukemia. Blood. 2016 May 19. 127 (20):2391-405. [Medline]. Greenberg P, Cox C, LeBeau MM, et al. International scoring system for evaluating prognosis in myelodysplastic syndromes. Blood. 1997 Mar 15. 89 (6):2079-88. [Medline]. Amin HM, Yang Y, Shen Y, et al. Having a higher blast percentage in circulation than bone marrow: clinical implications in myelodysplastic syndrome and acute lymphoid and myeloid leukemias. Leukemia. 2005 Sep. 19 (9):1567-72. [Medline]. Greenberg PL, Tuechler H, Schanz J, et al. Revised international prognostic scoring system for myelodysplastic syndromes. Blood. 2012 Sep 20. 120 (12):2454-65. [Medline]. Duong VH, Padron E, Al Ali NH, et al. The prognostic value of circulating myeloblasts in patients with myelodysplastic syndromes. Ann Hematol. 2018 Feb. 97 (2):247-54. [Medline]. Narayanan S. Clinical, hematological, and cytogenetic profile of adult myelodysplastic syndrome in a tertiary care center. J Blood Med. 2017. 8:21-7. [Medline]. Orazi A, Brunning RD, Hasserjian RP, Germing U, Thiele J. Refractory anemia with excess blasts. Swerdlow SH, Campo E, Harris NL, et al, eds. WHO Classification of Tumours of Haematopoietic and Lymphoid Tissue. 4th ed. Lyon, France: IARC Press; 2008. 100-1. Haase D, Germing U, Schanz J, et al. New insights into the prognostic impact of the karyotype in MDS and correlation with subtypes: evidence from a core dataset of 2124 patients. Blood. 2007 Dec 15. 110 (13):4385-95. [Medline]. Chen Y, Pourabdollah M, Atenafu EG, Tierens A, Schimmer A, Chang H. Re-evaluation of acute erythroid leukemia according to the 2016 WHO classification. Leuk Res. 2017 Oct. 61:39-43. [Medline]. Wang SA, Patel KP, Pozdnyakova O, et al. Acute erythroid leukemia with <20% bone marrow blasts is clinically and biologically similar to myelodysplastic syndrome with excess blasts. Mod Pathol. 2016 Oct. 29 (10):1221-31. [Medline]. Hasserjian RP, Zuo Z, Garcia C, et al. Acute erythroid leukemia: a reassessment using criteria refined in the 2008 WHO classification. Blood. 2010 Mar 11. 115 (10):1985-92. [Medline]. Soligo D, Delia D, Oriani A, et al. Identification of CD34+ cells in normal and pathological bone marrow biopsies by QBEND10 monoclonal antibody. Leukemia. 1991 Dec. 5 (12):1026-30. [Medline]. Steensma DP, Hanson CA, Letendre L, Tefferi A. Myelodysplasia with fibrosis: a distinct entity?. Leuk Res. 2001 Oct. 25 (10):829-38. [Medline]. Lambertenghi-Deliliers G, Orazi A, Luksch R, Annaloro C, Soligo D. Myelodysplastic syndrome with increased marrow fibrosis: a distinct clinico-pathological entity. Br J Haematol. 1991 Jun. 78 (2):161-6. [Medline]. Della Porta MG, Picone C. Diagnostic utility of flow cytometry in myelodysplastic syndromes. Mediterr J Hematol Infect Dis. 2017. 9 (1):e2017017. [Medline]. [Full Text]. Molteni A, Riva M, Cesana C, et al. Prognostic relevance of the flow cytometric count of medullar blasts in myelodysplastic syndromes. Eur J Haematol. 2015 Jun. 94 (6):519-25. [Medline]. Insuasti-Beltran G, Steidler NL, Kang H, Reichard KK. CD34+ megakaryocytes (≥30%) are associated with megaloblastic anaemia and non-acute myeloid neoplasia. Histopathology. 2012 Oct. 61 (4):694-701. [Medline]. Germing U, Strupp C, Kuendgen A, et al. Prospective validation of the WHO proposals for the classification of myelodysplastic syndromes. Haematologica. 2006 Dec. 91 (12):1596-604. [Medline]. Gohring G, Michalova K, Beverloo HB, et al. Complex karyotype newly defined: the strongest prognostic factor in advanced childhood myelodysplastic syndrome. Blood. 2010 Nov 11. 116 (19):3766-9. [Medline]. Kikuchi A, Hasegawa D, Ohtsuka Y, et al, for the Japanese Paediatric Myelodysplastic Syndrome (MDS) Study Group. Outcome of children with refractory anaemia with excess of blast (RAEB) and RAEB in transformation (RAEB-T) in the Japanese MDS99 study. Br J Haematol. 2012 Sep. 158 (5):657-61. [Medline]. Haferlach T, Nagata Y, Grossmann V, et al. Landscape of genetic lesions in 944 patients with myelodysplastic syndromes. Leukemia. 2014 Feb. 28 (2):241-7. [Medline]. Damm F, Kosmider O, Gelsi-Boyer V, et al, for the Groupe Francophone des Myélodysplasies. Mutations affecting mRNA splicing define distinct clinical phenotypes and correlate with patient outcome in myelodysplastic syndromes. Blood. 2012 Apr 5. 119 (14):3211-8. [Medline]. Rocquain J, Carbuccia N, Trouplin V, et al. Combined mutations of ASXL1, CBL, FLT3, IDH1, IDH2, JAK2, KRAS, NPM1, NRAS, RUNX1, TET2 and WT1 genes in myelodysplastic syndromes and acute myeloid leukemias. BMC Cancer. 2010 Aug 2. 10:401. [Medline]. Malcovati L, Papaemmanuil E, Ambaglio I, et al. Driver somatic mutations identify distinct disease entities within myeloid neoplasms with myelodysplasia. Blood. 2014 Aug 28. 124 (9):1513-21. [Medline]. Patnaik MM, Hanson CA, Hodnefield JM, et al. Differential prognostic effect of IDH1 versus IDH2 mutations in myelodysplastic syndromes: a Mayo Clinic study of 277 patients. Leukemia. 2012 Jan. 26 (1):101-5. [Medline]. Meggendorfer M, de Albuquerque A, Nadarajah N, et al. Karyotype evolution and acquisition of FLT3 or RAS pathway alterations drive progression of myelodysplastic syndrome to acute myeloid leukemia. Haematologica. 2015 Dec. 100 (12):e487-90. [Medline]. Daver N, Strati P, Jabbour E, et al. FLT3 mutations in myelodysplastic syndrome and chronic myelomonocytic leukemia. Am J Hematol. 2013 Jan. 88 (1):56-9. [Medline]. Bains A, Luthra R, Medeiros LJ, Zuo Z. FLT3 and NPM1 mutations in myelodysplastic syndromes: Frequency and potential value for predicting progression to acute myeloid leukemia. Am J Clin Pathol. 2011 Jan. 135 (1):62-9. [Medline]. List A, Dewald G, Bennett J, et al, for the Myelodysplastic Syndrome-003 Study Investigators. Lenalidomide in the myelodysplastic syndrome with chromosome 5q deletion. N Engl J Med. 2006 Oct 5. 355 (14):1456-65. [Medline]. Calvo X, Arenillas L, Luno E, et al. Erythroleukemia shares biological features and outcome with myelodysplastic syndromes with excess blasts: a rationale for its inclusion into future classifications of myelodysplastic syndromes. Mod Pathol. 2016 Dec. 29 (12):1541-51. [Medline]. Germing U, Strupp C, Kuendgen A, et al. Refractory anaemia with excess of blasts (RAEB): analysis of reclassification according to the WHO proposals. Br J Haematol. 2006 Jan. 132 (2):162-7. [Medline]. Strupp C, Gattermann N, Giagounidis A, et al. Refractory anemia with excess of blasts in transformation: analysis of reclassification according to the WHO proposals. Leuk Res. 2003 May. 27 (5):397-404. [Medline]. Willis MS, McKenna RW, Peterson LC, Coad JE, Kroft SH. Low blast count myeloid disorders with Auer rods: a clinicopathologic analysis of 9 cases. Am J Clin Pathol. 2005 Aug. 124 (2):191-8. [Medline]. Hasserjian RP, Campigotto F, Klepeis V, et al. De novo acute myeloid leukemia with 20-29% blasts is less aggressive than acute myeloid leukemia with ≥30% blasts in older adults: a Bone Marrow Pathology Group study. Am J Hematol. 2014 Nov. 89 (11):E193-9. [Medline]. Brunning RD, Orazi A, Germing U, et al. Myelodysplastic syndromes/neoplasms, overview. Swerdlow SH, Campo E, Harris NL, et al, eds. WHO Classification of Tumours of Haematopoietic and Lymphoid Tissue. 4th ed. Lyon, France: IARC Press; 2008. 92. Malcovati L, Karimi M, Papaemmanuil E, et al. SF3B1 mutation identifies a distinct subset of myelodysplastic syndrome with ring sideroblasts. Blood. 2015 Jul 9. 126 (2):233-41. [Medline]. Wang SA, Tang G, Fadare O, et al. Erythroid-predominant myelodysplastic syndromes: enumeration of blasts from nonerythroid rather than total marrow cells provides superior risk stratification. Mod Pathol. 2008 Nov. 21 (11):1394-402. [Medline]. Pourabdollah M, Chang H. Myelodysplastic syndrome with excess blasts-2 associated with erythroid predominance. Blood. 2017 Feb 16. 129 (7):918. [Medline]. [Full Text]. Hasle H. Myelodysplastic and myeloproliferative disorders of childhood. Hematology Am Soc Hematol Educ Program. 2016 Dec 2. 2016 (1):598-604. [Medline]. Table. Criteria Used to Classify MDS Cases as MDS-EB1 or MDS-EB2.